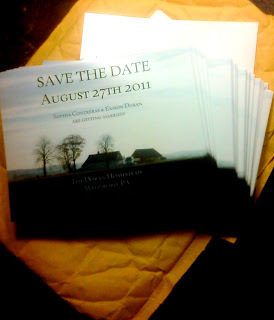 OMG My DIY Wedding: Save The Date PART 2! So after speaking with Eamon about the wedding we have decided to go with the easy rout. We came across a great deal for post cards (FREE!) well, plus shipping. We paid $6.80 for 100 postcards. The company vistaprint has a bad reputation. I can see why they are tricky and if you do not read everything just so you could end up sighing up for other services. The cards do have a small vistaprint.com printed at the bottom of the post card on the revers side. The logo will be cleverly covered with an address label. So, not a bad deal we plan on going the same route with the thank you notes. They are a little more expensive than the diy way but not by much. So, yes we are doing the invitations ourselves. I have found several cheap places to get quality card stock for about $10 per 250 sheets. I will list those later as well as my exciting trip to the bridal shop!